Three dozen bands on two stages over three days is a LOT to take in. 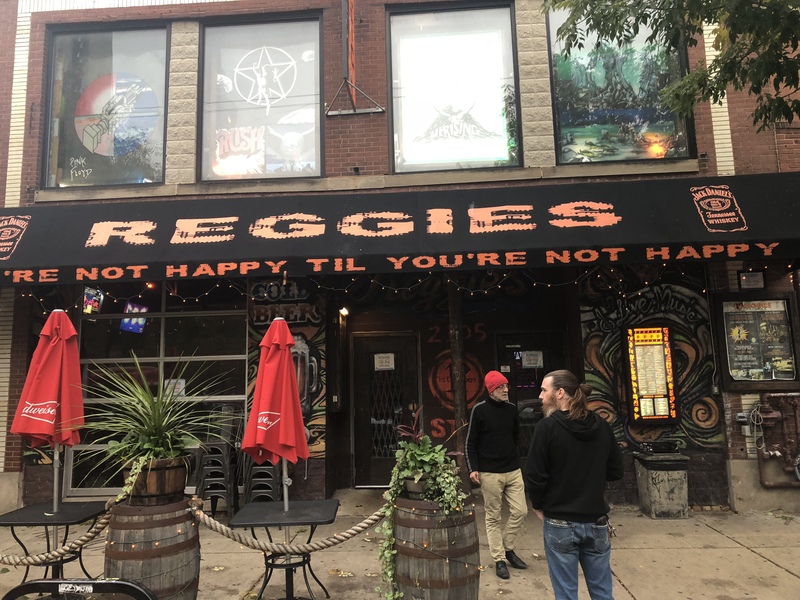 But that’s what #Progtoberfest is all about, and that is how I spent the weekend of October 19-21 at Reggie’s Nightclub in Chicago. Progtoberfest IV — marvelously organized by Kevin Pollack — featured bands from all over the world, playing music from nearly every aspect of the “progressive” spectrum. Fortunately, the sound of one band rarely, if ever, blended into the sound of the next. Each band brought its own style to the table. And while there were certainly no bad bands in attendance, some stood out more than others. Here are a few that caught my ear, and continue to take up residence in my mind. For a more comprehensive overview of the festival, take a look at the pieces written by my partner Thomas Hatton on the Proglodytes page. SOURCE — For the second year in a row, I was struck by the power of Progtoberfest’s opening band. Last year it was Sons of Ra. This time it was a Colorado trio called Source. While relatively young, it’s clear this band used mid-90s alt-metal bands like TOOL, Peal Jam and Chevelle as its foundation. The band’s musicianship was top-notch, featuring lengthy instrumental passages on top of confident and sincere vocals. The band played songs from its current album Return to Nothing. I’m told there is another record coming in the very near future. I, for one, look forward to hearing it. SCREAMING HEADLESS TORSOS — I was familiar with this band’s name, but had never heard any of its music. I made a conscious effort to check out this band’s set, which sounded NOTHING like I thought it would. I’m quite certain it was the band’s name that threw me off. Screaming Headless Torsos are groovy, jazzy, Latin-infused, and most of all funky. For the first time perhaps in the history of progressive rock festivals, I saw people dancing! Even more surprising was learning that vocalist Sophia Ramos had just joined the band, as she sounded and acted like she had been there for years. I’m eager to learn more about this band. THE NICK DVIRGILIO PROJECT, aka BILLY BURU — Drummer/multi-instrumentalist Nick Dvirgilio is a mainstay on the progressive rock scene, primarily with the band Spock’s Beard. This band — comprised entirely of fellow employees from Sweetwater Music in Fort Wayne, Indiana — served as the perfect reminder of why we came to Progtoberfest to begin with: to celebrate progressive rock! The band tore through prog rock standards from legendary bands like Genesis and Rush, among many others. Those in the know also got a healthy dose of inside jokes from the movie Caddyshack, which was good for more than a couple of laughs. Billy Buru also broke out a couple of original songs in their all-instrumental set. It will be interesting to see and hear this band evolve. AD ASTRA — I was struck by how tastefully this New York City-based band played throughout its set. Within the prog world, some bands have a tendency to overplay, just because they can. Guitarist Joe Nardulli and company went the other way, offering an open, inviting sound that made me think of a slightly heavier Eric Johnson. The band was forced to play without its drummer, who was called home due to an emergency. But Ad Astra made it through its 45-minute set playing to pre-recorded drum tracks, and did so with skill and aplomb. Their self-titled CD is a quality testament to Ad Astra’s musical abilities. STRANGE CHANGES — My notes for this amazing band open with the phrase “inspired insanity,” because that’s precisely what I heard. If Frank Zappa had taken on Ska, it would have sounded something like this. That the band is based in Boston and is friendly with the equally abstract Bent Knee came as little or no surprise. But this group is far from gimmicky. They are skilled musicians with a keen sense of pop that plays nicely alongside its avant-garde sensibilities. They are a live act well worth the time should they come to your town. SOFTEN THE GLARE — One great thing about Progtoberfest is that on the smaller “Music Joint” side, I can sit right in front of the performing band, take a few photos, and then fade back into the background. On rare occasion, a band leaves me rooted to my seat long after I’ve finished taking pictures. This year’s case in point was Soften the Glare. The Raleigh, North Carolina trio left me with my jaw on the floor, uttering “Damn!” to myself over and over. Their sound was enormous, full of rock-solid grooves, marvelous interplay, and a completely vicious (but good-natured) attitude. If Flea ever left the Red Hot Chili Peppers and joined a prog band, it might sound something like this. That’s a simplistic take, but I’ll expound on it another time. WESTWARD — Anybody up for a little “Cowboy Space Rock?” I’ve got just the band for you! Salt Lake City, Utah’s Westward offered up a nice mix of sci-fi scope, trippy notes, and pop swagger a la Muse to get and keep the Music Joint rocking. I also give them bonus points for swagger. Somewhere, there’s an arena with this band’s name on it. FRENCH TV — The Louisville, Kentucky band brought an unexpected dose of Brand X-like fusion to the proceedings late Sunday evening. They alternated flighty and heavy grooves, all with a great sense of fun. The band’s sound was highly imaginative, featuring angular guitar solos and killer grooves. One could also hear a touch of the band Bruford within French TV’s spectrum of influence. But this was no sound-alike. French TV is its own band, striving for its own sound, and doing so nicely. SOFT MACHINE — I must confess that I knew very little about this band, despite its legendary status in the prog community. I just hadn’t gotten around to them yet. Thanks to their first appearing in Chicago in 47 years, Soft Machine has a new fan in me. Band veterans John Etheridge (guitar) and Roy Babbington (bass) where marvelously augmented by newer member Theo Travis (sax, flute, keyboards) and prog drumming legend Gary Husband. The group tore through a set of tunes from its back catalog as well as a healthy dose of songs from its latest album. I will definitely be diving headfirst into this band’s discography. This was a great way to close down the Rock Club for the weekend. FM — The evening closed with another legendary band I knew nothing about. Not that it mattered. Canada’s FM positively tore the roof off the Music Joint, featuring musicianship I didn’t see coming, and that completely bowled me over. The band, led by original member Cameron Hawkins ripped through the group’s back catalog, culminating in playing the whole of the album Black Noise, to the delight of the packed house. If ever an encore was earned, it was on the heels of this performance. I hope to dig deeper into these bands as time permits. And I tip my hat to all the other bands who played Progtoberfest, including a couple returning from last year. I hope to hear more from each and every one of you in the future. Next One Book. One Reader. Two Viewpoints.